Western District Health Service supports its employees to participate in education and training to allow them to become the best they can be in their chosen profession. The Education Centre staff work in partnership with education and training providers to facilitate relevant, superior quality programs that meet the needs of our staff and those within our partner agencies. Staff members within the Education Centre facilitate a range of professional development programs provided inhouse including online education, a graduate nurse program, clinical inservices, medical education and events for general staff. See ‘Staff PD Programs’ for more information. Various events are also run at Hamilton and open to staff at other health care facilities. See our events page for current opportunities. Staff members are also provided opportunities to attend conferences and externally provided professional development activities. The Education Centre facilitates orientation programs for new staff at the service. We also facilitate placements for undergraduate and postgraduate students as part of their studies. The Centre offers the perfect environment for any meeting, conference, function or social event. It is available after hours and for weekend use upon request. For further information see the facilities and venue hire page. The Education Centre is located only minutes from the centre of Hamilton on the main hospital campus. 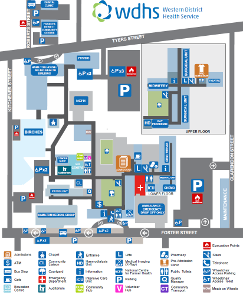 There is a direct entrance and car park off Kitchener Street, including spaces designated for disabled persons. For further information contact the Education Centre Reception.